Technology has changed everything, from how customers interact with your brand to how employees work and how organizations operate. Behind much of this advancement is the use of multi-cloud technology, microservices, containers and DevOps within organizations. The increasingly complex ecosystems, in-demand expertise and a growing list of competing priorities are presenting IT with new challenges. Enterprises are beginning to strategize which workloads fit best in the cloud, and how to manage multiple workloads across various cloud environments, while maintaining flexibility. The result is that IT organizations, and the CIOs that manage them, are being stretched to understand their overall enterprise business model, while being able to orchestrate the applications and supporting infrastructure to where the data and services reside. Subsequently, as cloud continues to mature, IT will no longer be viewed within the business as a cost center, but as a potential service provider. Gartner predicts that through 2022, a fast path to digital will be converting internal capabilities to external revenue-generating products using cloud economics and flexibility. In 2019, top enterprise performers will seek out opportunities to market their unique capabilities and shift IT to a revenue-generating part of the organization. To prepare for the changes ahead, IT will need to begin evaluating their decision-making framework to a model that positions the team to continuously manage applications across the enterprise, whether it's the of use containers to move data between private and public clouds, or the ability to run Kubernetes to help orchestrate cloud environments, and the capability to manage traditional, serverless, microservices applications. The first step in creating an effective application management process is for CIOs to understand the types of risk that their organization faces, including those that threaten customer relationships. Companies like Uber and Amazon rely on real-time data services and the next opportunity for CIOs is to manage these real-time apps and identify potential risk events. By 2025, IDC projects that 163 zettabytes of data will be created each year, and 25 percent of that data will be real-time in nature. That massive data that will have to traverse networks and be made available to apps instantaneously, creating an opportunity to manage technology that meets the business expectations of high customer demands while staying nimble to competitors, and addressing pressure on profits. In the next year, the way in which applications are built and designed will change significantly. We will continue to move away from monolithic applications into a world built on microservices, which will allow businesses to take advantage of a hybrid, distributed workload that is being load-balanced across both public and private platforms. These microservices allow for businesses to code themselves off large legacy platforms and move towards more agile environments. To get there, IT will have the autonomy to invest in cloud services but they will need to direct their spending in the context of the business objectives, versus through the lens of providing a functionality. As the transformation to digital continues, the ability of enterprises to streamline and improve application management and digital experiences by removing the friction with customers is the next frontier. In the enterprise, friction has appeared as fragmented customer profiles, department silos, inefficient workflows, slow feature deployment, redundant processes and anything that gets in the way of slow customer experience. Enterprises will need a flexible platform to help manage their applications, which is their frontline experience with customers. Removing the friction with the help of a flexible enterprise-grade platform will help IT move into the service provider role, and away from being seen as just a cost center. Ritesh Patel is co-founder of Nirmata and Vice President of Products and Marketing. He has 20+ years of experience building and delivering enterprise software solutions and has led highly successful software and business development teams. Ritesh began his career in engineering for high tech firms and has since migrated to the business side of the operation. 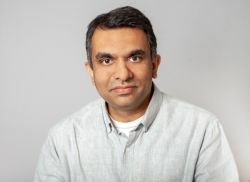 Prior to Nirmata, Ritesh led business development at Brocade, where he was responsible for defining the firm's cloud strategy and oversaw developments that advanced the entire cloud "as-a-service" market. Ritesh has also held key technical positions at Trapeze Networks (where he created industry award-winning products), Nortel, and Motorola. Ritesh holds an MBA from UC Berkeley and a master's degree in computer engineering from Michigan State University.